Are you selling your current house? No, for now our off-grid property is our second home. Our plans are to go down for about a week when we close on the property to do some initial work and make the house not look so 'abandoned', then go down again the last part of June and stay a few weeks. Then, hopefully one more time in early fall before our annual Turkey Palooza celebration with the kids, followed by a 'snowbird exodus' starting the first part of December. But wait, that is assuming we close before then. The answer to that one is still no. Emails keep going up and down the chain of those involved - from our realtor to the listing realtor, to the bank, to the title company and back down. Based on the last one we received, it seems everyone believes the paperwork is done, but NO ONE knows where that paperwork is. The answer to that one is also no. We have talked to several people who know of someone that has purchased foreclosed property and they all say it was a very long process. Also, Alan and I always approach big decisions by praying that they will only happen if they are not against God's will. So, the fact that we are ready to pay cash, the banks wants it sold, it is a terrific price make it all a 'go'. This delayed paperwork is our 'fleece', if that stops the sale, we know that is not the property for us. Having the long wait time has allowed us to think about timelines, plans, various options, etc. Alan has been spending a lot of time researching internet options and also coming up with a security solution that will work with a single solar panel. Since the house has been broken into once, we do have some worries about security while we are not there. This extended delay has given us more time to research various options and experiment with some of them. The details will be another blog. Gee, so far all the answers to questions have been 'no' and I want to answer 'yes' to the next one. Will you have a toilet? YES!!!! I was excited when I saw the bathroom & toilet. 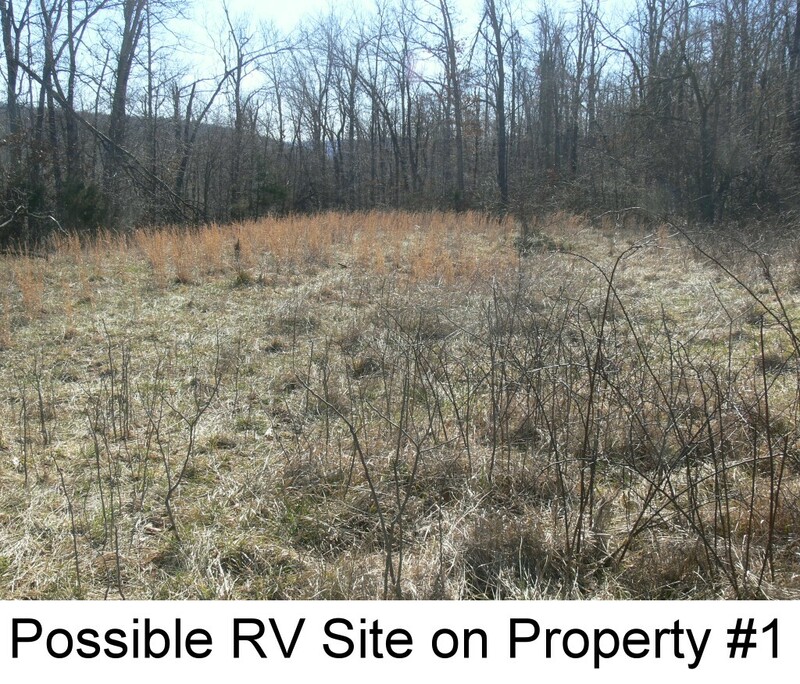 When we first started looking for property online, our focus was on property with plans of parking an RV on it. Then we saw some properties with rustic buildings (no bathrooms) that could also be a possibility. At that point, I resigned myself to the fact that we would either be dumping the holding tank on the RV periodically, investing in an expensive and not very attractive composting toilet, or using the ever 'popular' 5 gallon bucket with a toilet seat for a while. So yes, I am excited about a toilet and a septic system (we still need to test that). The bathroom is at the back of the house which is at the bottom of a steep hill, so the last time we stopped there before coming home in March, I checked out the lay of the land behind the house and it seems like we will be able to catch rain water in a storage tank that will then gravity feed the toilet. Alan has also been working on some interesting ideas for hot water for showers without a typical water heater. You're not going to have electricity? Yes, we are going to have electricity. Wow, two 'yes' answers in a row, we're on a roll. We are NOT going to have an electric bill as we will not be connecting the house to the electric pole. We will be generating our own electricity, mainly from solar power, but also possibly using micro-hydro and/or TEG panels. Oh boy, yet another future blog topic. With out possible security issues, we do not want to set up a lot of equipment during our first week long stay and then leave it unattended. So we will be getting accustomed to a juggling act of what powered devices we can use on our limited power supplies. We plan on leaving one solar panel set up when we leave to run the security system we are creating during this 'convenient' wait time. Being in such a remote area can either be thought of as a positive or a negative when it comes to security. On one hand, very few people travel on our little dirt road, so chance of vandals coming down it is remote. On the other hand, very few people travel down our little dirt road, so anyone with thoughts of vandalism knows they probably would not be seen by anyone. How far are you from civilization? We are located on a dirt road and have to drive several miles in either direction before we hit pavement. 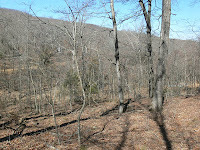 When there are no leaves on the trees, we can look across the ravine and see one neighbor's house. Across the road and down 'a ways' is a little house/cabin that looks to be used sporadically. On the other hand, we are about 20 minutes from a decent grocery store, and more importantly a hardware store. We are also about 35 minuted from 'major civilization'. Mall, restaurants, movies, and important stuff like Chinese food and fro-yo. In this picture of our road, you are seeing it at its best. Just a short way in either direction and it becomes MUCH rougher. Well, writing has helped me feel like we are making some progress. I needed an 'off-grid fix' since I have spent several days away from the topic while I have been working on a large programming project for my business. My business will still be in operation, we are just opening a new location :-). One great thing about my business, I can program from anywhere at any time. OK, the at any time may not be a great thing, I was up until 4 AM the other night to meet a deadline because I sometimes procrastinate or underestimate how much time is still needed to complete a project before a deadline. The only drawback of operating my own business over the past 6 1/2 years is that we have been tied to our current home area as that is where my server farm is located. We have occasionally taken the risk to travel further than a few hours away, but there is always the worry that one of the servers will develop 'issues' that can not be handled remotely and we would need to get to it ASAP. Part of our planning for moving off-grid was to make some changes to the server platforms so that we are no longer tied to a physical location. By setting up virtual servers with a larger server farm, we are eliminating our need to maintain our own server hardware. Mmmmm, hardware.... I think I need to go to Ace. I can stop any time, really. Remember in my first post I said I would be sharing the good, the bad and the ugly? Our first 'ugly' was ordering 1000 vacuum food sealing bags that DID NOT work with our food sealer. Well at least not at first... they just needed a little persuasion. Today we spent a couple 'interesting' hours trying to get a food vacuum sealer to work in a way it is not supposed to. It took a while, but we won the battle :-). As part of our off-grid plan, we want to have a back-up supply of inexpensive nutritious food we can easily prepare should we be without power, stranded due to an ice storm, or some other unforeseen emergency. Several years ago, our church packed a million meals for Haiti. These consisted of a rice based meal that is prepared with only boiling water, just like rice, and we decided to replicate them for our emergency supply. Well, not all 1 million of them! For a couple weeks we tried out several recipe variations to see what we liked best. We wanted to come up with something we would not quickly get tired of if it became our only meal for an extended period of time. I think of it as a rice version of Ramen Noodles. Once we settled upon a recipe*, it was production time. We wanted to vacuum seal the meal mixture in 2-person serving size bags so the we could simply empty the contents of a bag into a specified amount of water, cook and eat. The vacuum sealing would give us a longer shelf life as we mainly plan on using these for 'emergencies', but they taste really good so they will also be quick meals at other times as well. We discovered the bags for the vacuum sealer were expensive - about 50 cents per bag, while the meals themselves were costing only 23 cents. It did not make sense to spend twice as much on the packaging as on the actual food. I went online to Uline, a great supply house for all sorts of packaging, because I remembered they sold the sealers. They sell two types of bags, the brand that came with our sealer that were about the same cost and another type that were only 5 cents each. These bags were described as 3 mil thick, but that did not give us a clue as to their durability. We started searching the house for various plastic bags to see if we could determine what 3 mil would be like. First we looked at a package of Zip-Loc bags, but the thickens was not listed. Then we checked out our garbage bags - 22.8 um (picomil). If I don't know what a mil is like, I certainly haven't a clue what a picomil is like compared to it! Next we found a roll of plastic we used to cover a drafty window this winter, it was 4 mil plastic. So the 3 mil bags are somewhere between the garbage bag thickness and the window plastic, still not very helpful. Just like all good Geeks, time to start googling... why look in the real world when there are better answers at your finger tips. I googled 'smart seal zip loc bag thickness' as that was the type of zip loc bag I had on hand and it seemed as if we would need something a bit thicker than that but thinner than the window plastic. Within seconds I had my answer - zip loc bags are 1.75 mil thick. Store that knowledge away as I am sure you will need it someday, maybe you will be on Jeopardy and the category will be 'Food Storage Know-How'. So, after all that, we decide 3 mil sounds just right and we order them. 4 tsp powdered soup base, vegetable, chicken, beef etc. To cook, dump the contents above into 3.5 cups of boiling water, reduce heat, simmer 20 minutes or until rice is soft, stirring occasionally. Let cool a couple of minutes and stir to thicken. FOOTNOTE: We did find a lead to pre-made storage bags that have the needed texture and are guaranteed to work on all vacuum storage systems for 17 cents a bag. That is much better than 50 cents a bag, but still 3 times the price of the smooth Uline bags in our video. So, with the expected early closing date to take place before April 3rd, our original spring trip is changing from a property search to the Lehman's trip described in an earlier post. The trip to Ohio is fast approaching and still no closing date. We discover that there is a discrepancy in the property's legal description, and that is holding things up. We have no details of what the problem actually is. Our decision between going to Ohio or heading to a possible closing is not settled until the night before we are scheduled to leave for Ohio. There is still no closing date, or even corrected paperwork to allow for a closing date to be set, so we head to Ohio. April 3rd arrives and the bank selling the property has to scramble to set up an extension. They have us sign the agreement and get it back to them while we are in Ohio. They set the new closing date to be on or before April 13th. When we get back home, Alan starts researching the properties title history and discovers what the problem is. Two titles ago, when the property sold to the people that later lost it in foreclosure, there was a typo in the description and one word was changed from 'northeast' to 'northwest' and that is what is causing the delay. April 13th had come and gone and the newest extension now sets closing as on or before May 13th. The person supposedly in charge of the title search and closing said they had 'no idea' what date to put on the latest extension, so it seems that May 13 was a date pulled out of a hat. For anyone that wants to know how one word can hold up the closing for weeks on end, here is a little explanation of how properties are laid out. We discovered this same system is used across the United States. The largest blocks of land are laid out with Township and Range numbers that can be thought of as X and Y coordinates on a graph. Each of these blocks is broken into 36 sections, which are one square mile each. Each section is divided into quarters and each of these quarter sections is 160 acres. Confused yet? It should get clearer in a minute. I have drawn a couple diagrams I think will explain the 'issue' with our property. Alan commented that I have become very adept at hand drawing this diagram upside down as I have sat across the table from various people and explained the problem. The diagram on the left is the Section our property is a part of. I have divided it into Quarter Sections (three tan and one that is further sub-divided, which is the one associated with our property). Back in the 1970's, several titles ago, one person owned the Southwest 40 acres that is the two green shaded areas in the NorthEAST Quarter Section (sub-divided square). 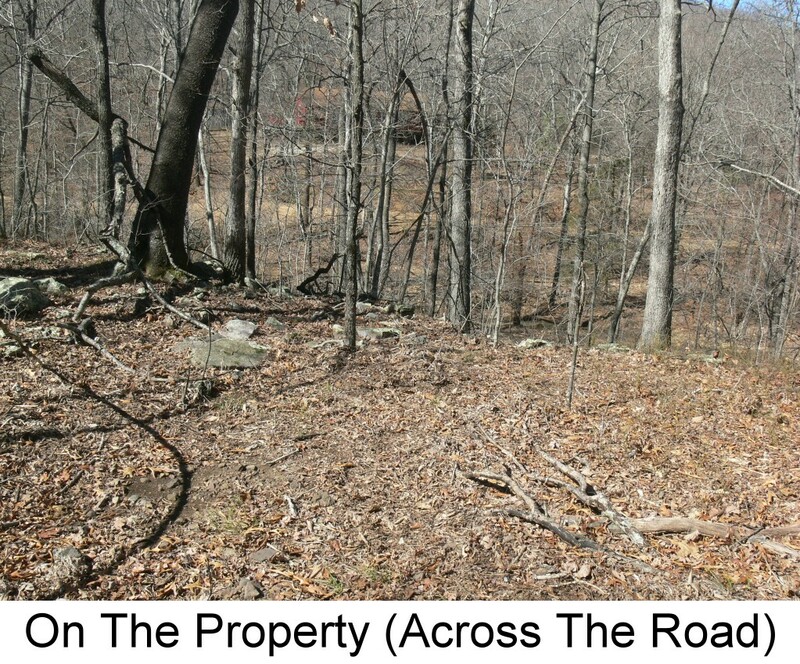 This person sold these 40 acres to two brothers, each owned half-interest in the 40 acre plot. The next title change occurred when each brother sold the other brother half of the half-interest in the 40 acres. This split the 40 acres into a north 20 acres (dark green) 100% then owned by brother 1, and south 20 acres (neon green) then owned by brother 2. The next sale is what is causing the problem. The brother owning the neon green 20 acres sold it to the people who eventually lost it in foreclosure, but the title created for this sale called it the south half (correct) of the southwest quarter (correct) of the NorthWEST (wrong!) Quarter Section. Changing that one word from Northeast to Northwest, now places the property, according to the legal description, where the pink rectangle is on the diagram to the right. Remember in a previous post where I joked with the realtor that our 'as is' property could end up being 5 miles down the road? I guess we shouldn't have laughed that off as 'never gonna happen'. Next, the bank foreclosed on the property and another title was created, but it used the same description as the previous, incorrect title and the mistake was not noticed until the title search was started for the sale to us. So, while we are glad the error was caught and is being corrected, I can't imagine the time, cost and effort being expended to change one word back to what it had been throughout the history of the property until recently. By the way, if you need a title search, Alan has become quite the expert! I should use my drawing to explain another 'Geek moment' I had. Friends recently asked us what we were going to call our property. Alan and I anthropomorphize just about everything we own, especially our cars, so we should probably at least give our property a name. Alan suggested 'Geek Acres' and has even re-written some of the lines to the theme song of the old 'Green Acres' TV show. I, however, made a further stretch that, while I think it is somewhat ingenious, may be too far of a stretch for people to get. See our bright green rectangle of land in the diagram? It could also be called a quadrangle, which is also often shortened to Quad when referring to buildings and spaces - like a Quad on a college campus. In fact, I just checked dictionary.com and it lists the definition for Quad is 'a quadrangle, as on a college campus'. Thus, my suggest to name our property is "Geeks' Quad". Get it? A play off of Best Buy's Geek Squad. Oh OK, it is too much of a stretch if I have to explain it, but I still like it. And, like Geek Squad, we do drive a diesel VW beetle, who by the way is named Scooter and has a great personality. 1. Have we closed on the property, YET? No. 2. Any idea when? Up until yesterday, those supposedly in the know, were telling our realtor they had no idea when to expect a closing date. Yesterday we received an email that said possibly next week. 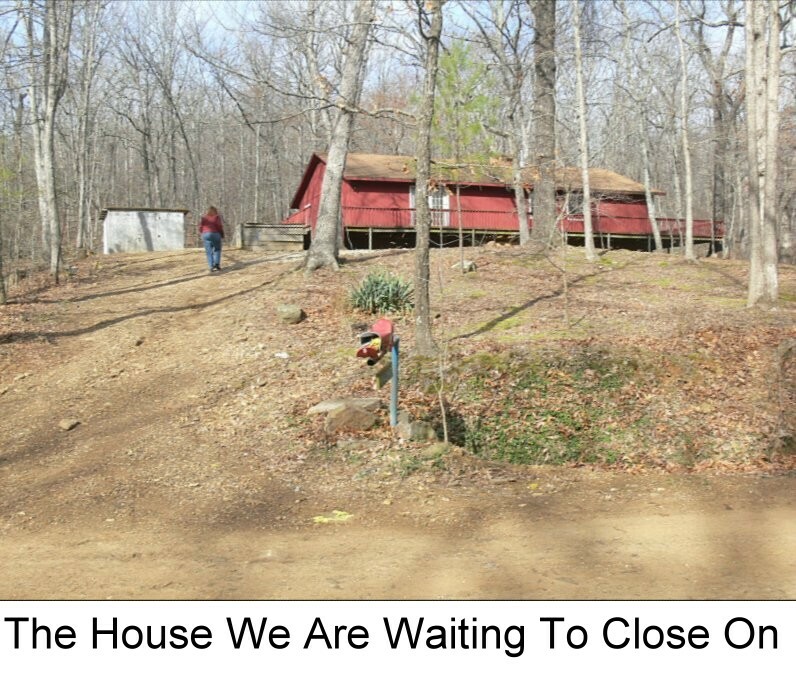 OK, so if you have read through the blog entries, you know Alan and I are impatiently waiting to close on property in the Ozark Mountains. I was not planning to share the property search saga until after we closed, but as we had to agree to yet another one month extension today, I will go ahead and start the story. Around the first of the year, Alan and I decided it was time to become more proactive in realizing our dream to find property where we could live off-grid. Technically, you can live off-grid anywhere, just shut off your connection to the public electric company, or stop paying your bill and they will do it for you :-). But, we wanted to go off-grid in a location more suited to the life style. I do not think our neighbors in town would like us cutting down their trees for our wood burner and the village ordinances would probably not allow an outhouse or other alternative septic solutions. So, the search began. Our plan was to research possible areas of the country that would meet our criteria, narrow it down to specific properties and then take a road trip in the spring to look at the most promising properties. However, about a month into the research, we realized that many of the properties we listed as having potential were selling quickly. We would bookmark the web sites, then go back in a week or so to look at them and many of the properties were already sold. So, we moved up the timeline. 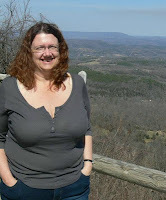 The Ozark Mountains seemed very promising, we particularly liked a lot of listings on one realtor's site, so we contacted her and made plans to spend about 5 days viewing properties in the Ozarks. We drove our 4 wheel drive vehicle because some of the properties we were interested in could only be accessed with 4 wheel drive. We had given the realtor a list of some properties we wanted to see, but as we were driving from the hotel to meet her near the first property, I was wondering how do you explain to someone what you consider 'prime property' from an off-grid point of view? We were definitely not your typical 'older couple' looking for 'snow bird' retirement property. We were looking at some pretty remote pieces of property, so our realtor met us at a small village square, and rode with us to the property. She did first ask if we were serial killers or axe murderers, I am sure we would have answered honestly if we were. Within a minute of her getting in the car, as we were trying to give more details of what we wanted to do with the property, she told us that she and her husband had moved to the Ozarks a few years ago with the purpose of living off-grid! Wow, a kindred spirit, and one with years of experience helping us find our property. So, off we go to property #1. It was about 5 miles off blacktop, that is 5 miles down a bumpy dirt road. 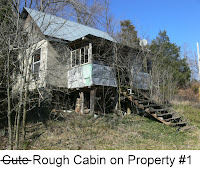 The property had a small cabin, some small rough outbuildings and a well that may or may not be working. One of our top criteria was some form of water on the property, but our realtor told us they had been catching rainwater for several years and have never had a problem, a good rain storm can fill their 500 gallon cistern. While the property was nice, and the cabin 'quaint', it would take a lot of work to make it livable. The cabin and out buildings had at least a foot of trash covering the floors. And by the way, there are poisonous snakes in the area and they would probably love living in all that trash. Still the place had a lot of potential and we kept it on our list of possibilities. 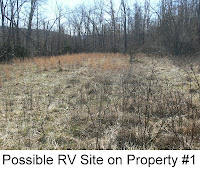 We were also considering empty land to park an RV on, so we could do that while fixing up the cabin. Oh, one other drawback, our closest neighbor would be a chicken farm and depending on how the wind blew in the summer that might not be too pleasant. Property #2 had Alan 'aquiver' as soon as he heard about it because it was a mountain top. The views were beautiful, and there was a logging road on the property that we could park an RV on, if we could get the RV up the mountain. I felt the fact you had to go up and down the mountain would make it too difficult, it would feel more like survival at times than living the good life. Alan agreed that I was probably right and said that he was more enamored with the idea of owning a mountain top vs. actually living on a mountain top. 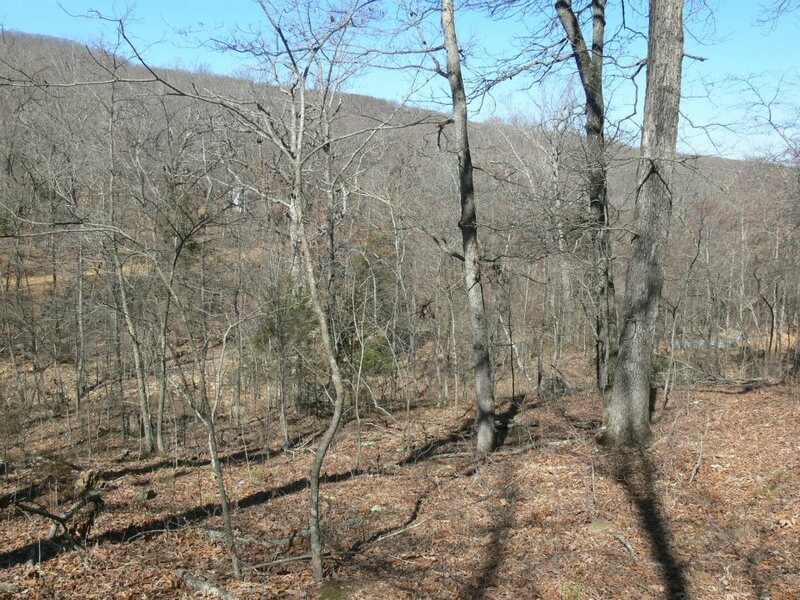 The third property we wanted to look at was in Oklahoma, quite a distance from the Ozarks, but it sounded promising and there was also a second property in the same area. So, the next day we headed to Oklahoma. After driving quite a distance, leaving the Ozarks, going through Arkansas and almost into Oklahoma, I get a phone call from a client. Cell service is spotty, so Alan decided to pull off the highway so I can keep the connection for the length of the call, and he decides to get gas at the same time. As he finishes pumping gas, he looks at the ground and there is a pool of gasoline. The gas tank on the Sportage just sprang a major leak. We make a mad dash to the airport about 5 minutes away to get a rental car, and then I follow Alan to the nearby Kia dealership. I loose site of him at one point, but can still follow his trail of gas on the road! He had several people run up to him at stop lights to let him know gas was pouring out of the car. So, after that bit of excitement we now continue into Oklahoma with our rental car. Remember, we took the Sportage so we could access some of the properties? Well the only rental we could get was a Mercury Gran Marquis, little did the car know what it was in for. We were following maps to the next property and had gotten down to dirt roads. We just passed a 'Y' in the road that we thought was about 500 feet from the property, when we came to a stream crossing the road that was about a foot deep. We could have crossed it with our Sportage, but decided we better not try it with the rental. Alan decided to cross the stream and walk the rest of the way since we were so close. He would come back and get me if it was worth looking at (no cell service again). About 45 minutes later, and still Alan has not returned. I ford the creek, and head up the road and start calling out to him. About 15 minutes later I see Alan in the distance coming down the road. Turns out the 'Y' we passed was not the one we thought it was, it was about another 1 1/2 miles up the road. Alan had passed it on his 'stroll' but knew I would be getting worried so he turned around. During his walk he could not get any calls out to me, but at the furthest point he got a text message 'Congratulations, you have won an iPad!' So he quickly tried to text me again, but the small 'bar' of signal had disappeared already. Alan had tracked his walk with the GPS on his phone, so back at the hotel we checked and he had come within about 150 feet of the property we were trying to get to! By then we decided we were not supposed to buy land in Oklahoma. The following day, back in the Ozarks, our realtor was not available, but she had shown us some other listings when we were at her office, so we went to see one on our own. We had seen it when we were conducting online searches in Wisconsin, but had passed over it because the description did not list some of our criteria. Turns out it was actually more interesting than what was included in the description. It was a three bedroom house on 20 acres that had been foreclosed on. At some point the home had been vandalized for the copper and wiring (who steals Romex?) The house is near the road, and backs up to a wooded hillside. We start exploring the property and this looks like it may be the one. There is a well, cistern and septic as well as a ravine coming down the hillside with a stream. Across the road is a creek, but as it is on the other side of the road from the property, we don't pay too much attention to it. We consider the holes in the dry wall a 'plus' as we will be rewiring for a 12V system and this gives us a head start. We are pretty sure this is the one, and the next morning we are back at the realtor's office to tell her we found the the property we want. She pulls up the topographical map and to our surprise, the 20 acres is not the property behind the house that we had explored, but it is the property on the other side of the road from the house. 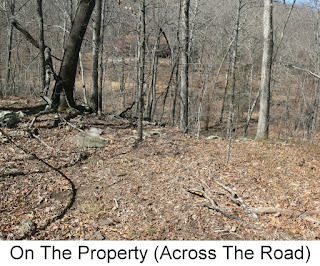 The property ends right behind the house but then extends across the road for most of the 20 acres. So now we have no idea of what the actual property is like, except for the creek next to the road, so back we go to explore the real 20 acres. The good news is, it's still the property we want and we put in an offer. We discover it is a 'Freddie Mac' property, which means it has been foreclosed on, a bank now owns it and while the procedure is a bit different to purchase it, it should be no problem as we are ready to pay cash. With our car in the shop, we are now stranded in the Ozarks for a few extra days so we hope to hear if the offer is accepted before we leave. It is accepted and closing is to be 'on or before April 3rd'. Our realtor assures us that the closing will probably be before the deadline because it is a cash deal so the bank will move quickly. A little background on Freddie Mac properties: if we, the buyers, delay the closing past the closing date that was set, we are fined $100 per day. The sellers (bank) have no such stipulations. Also the property is totally 'as is' with no survey. If the 20 acres actually turns out to be 5 acres, that is what you get. Our realtor says that is an exaggeration of what the pit-falls can be and I joked that with no survey the property could actually be 5 miles down the road, she laughed and said technically yes, but that could never happen. 2. Do we know what the hold up is? Yes. I will save that story for my next post. I have been addicted to fabric stores for years, but I have been resourceful and turned that into an asset. I search out great deals on fabric and patterns and then resell my finds on eBay. 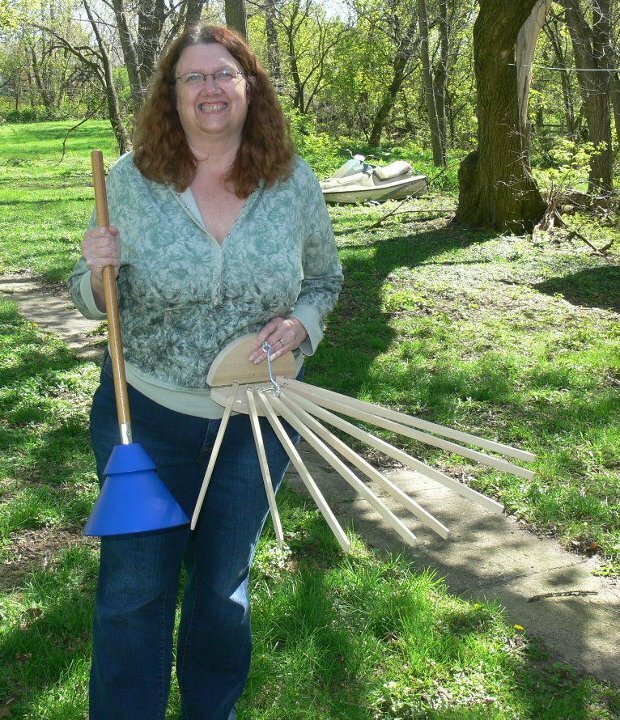 Here are some of my symptoms: it is extremely difficult for me to drive past a fabric store, when I open my mailbox and see a fabric store flier my pulse quickens, every Saturday night after midnight, I go to the Hobby Lobby web site to see if they have patterns on sale the upcoming week. Yes, it is a long standing addiction. But this weekend I discovered a new vice. Alan and I were out to lunch at our favorite diner and I picked up the local community paper to see if there were any garage sales where I could pick up some canning jars. As I opened the paper, a Menard's flier fell into my lap and all the sudden I felt my pulse quicken as if it were a sale ad for JoAnn's Fabric. Early the next morning, we enter Harbor Freight and we each grab a cart. 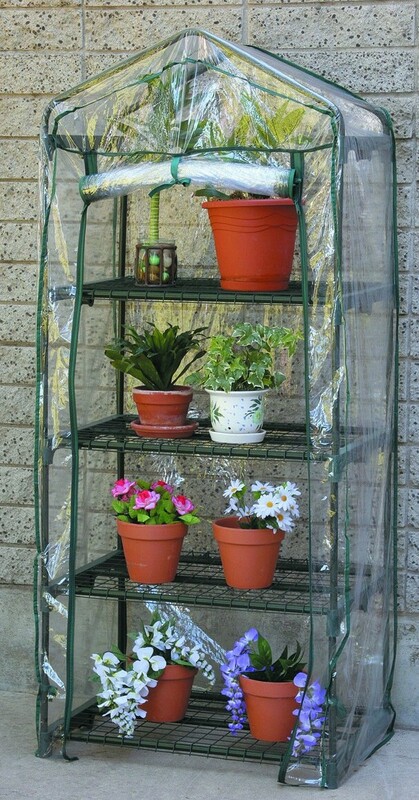 The first item on my list, the greenhouse pictured here. While I may use it as a greenhouse at some point, I have learned you can use one as a solar food dehydrator. An RV style refrigerator with a freezer could run off the 12V system we will have in the house, but we do not want to be bogged down with trying to maintain enough solar charged batteries to keep it operating 24/7, or that much LP fuel to keep it running. While you can get propane refrigerators with freezers we opted for a fridge only version. Adding a small freezer almost doubled the amount of propane consumption. Having a goal of self-reliance and no practical power source to operate a freezer, has me researching canning and dehydrating solutions. I am compiling recipes into a 'want to try' list and will start a second tab on this blog when I have verified some that are 'keepers'. Our best deal at Harbor Freight was our first solar panel kit. We have been evaluating different options, and went there with the intention of buying a single, inexpensive solar panel we could set up to charge some gel cells to power our AT&T cell service and a wireless IP camera. We will use these to check on the house when we are not there. Plus, this set-up will be our initial internet connection while we are down there periodically working on the house. We found a solar panel kit that included three solar panels and some other parts we will need that was on sale. We had a coupon for 25% off any one item. With the coupon, the three panel kit was less than what two of the single panels would normally be so we went with kit. Although we only need the one panel immediately, we will be adding in the others in a short time. 1. What is the current learning curve project? Solar panels. There are two main types of solar panels: Crystalline and Thin Film (amorphous). Crystalline are the most efficient, and produce the most power. Crystalline come in two types: Mono and Poly. Monocrystalline are the most efficient, and the most expensive. Thin Film, better known as 'amorphous', are the cheapest type of panels, the Harbor Freight panels we just bought are amorphous. This type of panel are very inefficient, but they have three features that should be considered: they take outside heat from the sun and weather very well, they are an inexpensive way to get started and learn about solar power, and, most important, in less than bright sunlight (cloudy days), they keep chugging putting out power when both types of crystalline panels would shut down. If you have no problems with shade or frequent cloudy days, crystalline panels would produce more power for you in a smaller area. 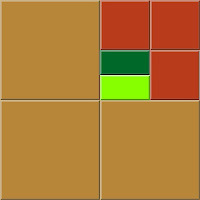 Many people are experimenting with an array of panels of mixed types. I'll post more on this topic when we start to play with it. My husband and I have always looked forward to being empty nesters. We love our children and had a wonderful adventure raising them, and if I do say so myself, they turned into awesome adults that it is now our joy to share friendships with. However, we have always made our relationship with each other a priority over our relationships with our children. So, when all three moved out of the house within a two week period we were excited to start a new season of our lives together. And now, a few years later, we are embarking on yet another adventure in our lives - our empty nest is going off-grid! I am not sure if people who know us will be surprised and think we've lost our minds, or if they will chalk it up to one more way we live life outside the 'norm'. Rather than bog down this initial blog with a lot of background and information about us that would explain that last sentence, I plan to add that into various blog entries along the way. For now, it will suffice to say that our jobs and interests to date have been very 'tech-centric', and for us, moving off-grid does not entail giving up our high-tech toys and business. When we started planning this, I had jokingly called myself an Off-Grid Geek, which got me thinking about the possibilities of this blog. While people choose to live off-grid for a wide variety of reasons, the purpose of this blog is not to become a soap box for why we chose this life-style change, but rather a chronicle of how we are doing it and what surprises we find along the way - the good, the bad and the ugly. I am writing this and possibly a couple more entries several days if not weeks before I actually publish the blog site. Why? Because, while we broke the news to our kids a couple weeks ago, we have not yet 'gone public' with our plans. We are waiting until we can finally close on the property we are moving to. More on that when we know the actual closing date - another story in the works once we know all the details. 1. Where am I now? Sitting in a hotel in Strasburg, OH. We made a trip from Wisconsin to here for the sole purpose of visiting a very specific hardware store - Lehman's in Kidron, OH. Why such an effort to come to this specific store? Because it is in the heart of Amish country and caters to the needs of their Amish customers. That special attention has expanded over the years to the point that they publish a 170 page Non-Electric Catalog. Just like kids with the Sears Christmas catalog in years past, we have been perusing this catalog (well mostly online) and creating our wish lists. Yesterday we were able to check many items off out list and then some. Pictured here are my $18.95 washing machine (just add water & muscle) and $29.95 clothes dryer. Now I just need to get water set up in the house without the help of electricity and my laundry room will be set. 3. What is the hardest part right now? Continuing life as normal as possible when there are so many plans racing around in our heads and so many things we want to get started on. We will not be moving off-grid for months yet, and it is going to be hard to spend just a few days on the property after we close and then return to 'normal life' until we can make another trip to work on more projects.